History does not repeat, but there are a few refrains it loves to come back to. We can safely say the ICO bubble is over now. Why did the ICO bubble happen? It’s easy to believe that the ICO bubble, having taken place on uncensorable public blockchains, was a fundamentally new phenomenon. In this blog post, I’ll examine three major moments in history that illuminate three separate social dynamics that were at play in the ICO bubble. The first is the peer-to-peer file sharing revolution in the late 2000s, which explains the ideology of decentralization, the proclamations of revolution, and companies trying to circumvent securities laws. The second is the penny stock boom of the 90s, which explains the casino of shitcoin gambling, market manipulation, and fraudsters that comprised the long tail of ICOs. And the third is the dotcom bubble, which explains the mass of speculators, the new paradigm of decentralized companies, the VC coins, and the redistribution of wealth. By exploring these episodes, I hope to show you how the ICO bubble recapitulated well-known patterns of human behavior. So who was the ICO boom for? The P2P file sharing revolution began in 1999, with a little application coded up by a college student. The application was called Napster. On its face, Napster was straightforward: log in, search for a song you want, double click, and it’s yours. It sounds simple, but it’s hard to describe how large of a paradigm shift Napster was. Remember what it was like to purchase music in 1999: standing in a CD aisle, surrounded by rows of disc jackets, debating in your head which album to spend your $20 on. Jay-Z? Smashmouth? Or maybe J-Lo? Every purchase was a careful tradeoff. Music was scarce and precious. Napster changed all that. It was like a bank vault of music was propped open, free for anyone to plunder. Entirely via word of mouth, Napster spread across America like a riot, clogging up bandwidth on college campuses and dialup lines. Soon, legal challenges from Metallica and Dr. Dre would thrust Napster into news headlines. Napster seized the national conscience. At its peak in 2001, the service had more than 80M registered users. The RIAA took notice. After a lengthy court battle with the RIAA, a judge ruled Napster liable for all of its users’ copyright infringement, despite the fact that Napster’s servers didn’t host any copyrighted content. This legal doctrine, known as vicarious infringement, was the death knell of Napster and of any file sharing-based business model. Napster was driven to bankruptcy and forced to clamp down on all illegal file sharing. But Napster’s surrender was only the beginning of this war. To the digital revolutionaries, the lesson of Napster was obvious. Despite all downloads being peer-to-peer, Napster operated a central server, primarily used for search indexing and peer discovery. This was its downfall. If the file sharing revolution were to continue, it would have to decentralize and become resilient to legal injunctions. A traditional war had to evolve into guerrilla warfare. Decentralized alternatives to Napster gradually arose, intentionally designed around this legal constraint. Successors like Gnutella (LimeWire) and eDonkey2000 (eMule) would have decentralized architectures that would be much more difficult to take down. As the children of Napster proliferated, a philosophy began to solidify around internet piracy. Slogans materialized: “information wants to be free,” “open culture,” “sharing is caring.” A new political party called The Pirate Party was formed, championing online freedom and copyright reform, winning multiple political appointments across Europe. Radical innovations in intellectual property were explored such as the Creative Commons and copyleft licensing. The revolution had gained an energy and identity of its own. BitTorrent, founded by Bram Cohen in 2001, would arguably be the last stage in the evolution of P2P file sharing. The BitTorrent protocol overtook KaZaA, Limewire, DC++, SoulSeek, and all the other P2P networks. By 2012 it’s estimated to have peaked at a staggering 400M-500M monthly active users, almost half of the entire Facebook userbase at that time. During its peak, BitTorrent was by far the single largest source of Internet traffic in the world. It’s worth asking: why did BitTorrent dominate file sharing while other networks fell into irrelevance? Simon Morris, a former executive at the BitTorrent company, wrote an excellent four-part tour de force analyzing the parallels between BitTorrent and crypto (if you can’t be bothered to read the whole thing, I encourage you to read its final chapter). I’ll be building upon many of his insights here. It is a surprisingly dry, intellectual manifesto. Bram Cohen explicitly disavowed all illegal file sharing usage of BitTorrent. He never once acknowledged this as a legitimate use of the service. The core team and their messaging was unimpeachable. And this is precisely what allowed BitTorrent to flourish on the back of all of its legitimate uses: Linux distros, World of Warcraft updates, dataset sharing, and so on. BitTorrent was never supposed to be a revolution in internet piracy; it was supposed to be a revolution in low-cost file distribution. This unobjectionable mission statement made BitTorrent safely beyond the reach of the RIAA or any other aggrieved copyright holder. There’s a striking parallel with crypto: Vitalik and the Ethereum core team never endorsed the flood of ICOs — they often denounced them. This is precisely what allowed Ethereum to flourish, despite being subverted by ICOs for speculative and extralegal purposes. If Ethereum did not brand itself as a revolution in decentralized computing, as “the world computer,” it would have been labeled by regulators as an illegal ICO platform. If you fast forward to today, the story of P2P file sharing is the story of BitTorrent. All other protocols have faded into obscurity. But BitTorrent is no longer used for downloading music in the western world. I’ll give you three reasons: Spotify, Apple Music, Pandora. Newcomers in the music industry have adapted, and these services transformed the experience of discovering and listening to music. P2P file sharing once competed against the experience of driving to Walmart and buying a $20 DRM-protected CD to listen to a single hit song. Between the two options, the decision was comically easy: just pirate it. I realised that you can never legislate away from piracy. Laws can definitely help, but it doesn’t take away the problem. The only way to solve the problem was to create a service that was better than piracy and at the same time compensates the music industry — that gave us Spotify. Today P2P file sharing has significantly declined. But make no mistake: the digital piracy revolution moved industries. It forced music and film to cater to a digital-first world and eventually incentivized the invention of web streaming. The companies that didn’t adapt are now footnotes in history. Those that did will get to build the media dynasties of the next decade. If you listen to Lawrence Lessig or Peter Sunde, it’s easy to assume the file sharing revolution was rooted in ideology. But few file sharing veterans are still committed to piracy today. Trying to explain file sharing by appealing to intellectual property reform is like trying to explain the Boston Tea Party by appealing to John Locke. Ideology, while important, is usually post hoc. The real story is much simpler than that. The file sharing revolution took off because people opposed a rule: you can only consume music how the record industry says you can. People hated this rule. So they broke it. And P2P protocols enabled this great, overwhelming mob of rule breakers to demonstrate the way they thought music ought to work. Today, music works that way. No matter where you are, by doing a search and double clicking, you can listen to almost any song ever created. Simon Morris claims this was the raison d’être of BitTorrent, and of decentralized networks more generally. Decentralization allows rules to be broken. And when a rule is opposed widely and strongly enough, people will build the technology to break that rule, and that technology will spread. Without this sort of rule-breaking (whether by accident or design) it’s quite hard to imagine why decentralized blockchain technology even matters. It’s a distributed data store with a complicated and slow update mechanism… The one value proposition that everyone seems to agree on for blockchain technologies is that they are ‘censor-proof’. And this matters only if you have something that someone wants to censor. So why did ICOs need to be decentralized? Why couldn’t the bubble have kicked off through equity-backed blockchain startups like in the dotcom bubble? To Simon Morris, the answer is obvious: because ICOs were not just about the chance to invest in speculative blockchain projects. They were also about breaking rules: the rules around capital formation. This begs the question, why do people want to break the rules around capital formation so badly? Consider the initial conditions of the ICO bubble. The bubble was primarily driven by countries in Asia with high savings rates and income inequality — China, Japan, and Korea. Over the last decade, we’ve seen income inequality rising, declines in wage growth for the global middle class, waning trust in governments, and a mass of overeducated young people with shrinking opportunities. The ICO bubble was a loud rattling of this cage. The most massive wealth creation events in the world took place over the last decade — but it all went to other people. You didn’t get any. This new wave of technology has subjugated your digital life and attention span, but its fruits belong to the capitalists in Silicon Valley, not you. The ICO bubble let young people convince themselves: hey, maybe I can get my share. I see this Bitcoin thing, I see this Ethereum thing, they’re so novel and revolutionary, why couldn’t they change the world? And wouldn’t they get just a little convinced that for once, they were a step ahead of their parents, ahead of the gatekeepers, ahead of Wall Street and Silicon Valley? So they got in early. They started using VPNs. They got friends and family to create overseas accounts. They broke the rules. And what were those rules good for anyway, besides rigging the system for the rich? Why couldn’t anyone in the world invest in whatever they wanted? Who needs disclosures anyway, if the future is going to be open source? The market kept proving them right. So they speculated, they joined Subreddits and debated ideas and convinced themselves that their investments would revolutionize the world’s infrastructure. A decentralized future was fast approaching, and they were going to be, for once, at the vanguard ushering it in. And of course, when reality finally caught up, it showed them the consequences of breaking those rules. 2018 brought everything crashing down, laying bare all the scams, frauds, and widespread market manipulation. A once ecstatic market flattened out like a pancake. And here we must also acknowledge the other side of the market: entrepreneurs. To them, ICOs represented a great equalizer. After all, ICOs were dispersed internationally, and venture capital is still hard to come by outside of Silicon Valley. In the age of the Internet, in the age of blockchain, why hadn’t technology already leveled the playing field? Why should it matter where an entrepreneur lived or what language they spoke, so long as they knew the language of programming? With ICOs, you didn’t need an intro to Sequoia to get your company started. Now you simply needed a good idea and a white paper, and the world’s capital would beat a path to your door. Remember all the stories of VCs quaking in their Patagonia vests, worried that they were being displaced? And then there were the reverse ICOs, where established companies ICOed their own token, as in the case of Kik or Kakao. This is perfect if you want to fund an internal blockchain-related initiative, but skip all the burdensome overhead of shareholder protections or revenue generation. Even among startups funded by Y Combinator, the hottest accelerator in the world, I heard reports that a startling number of them were pondering ICOs. Even Silicon Valley elite wanted to break the rules! In this case, they wanted a way out of their illiquid startup ownership, and speculators were all too happy to provide it to them. It was only in retrospect that they would each realize why these rules were there in the first place. Once again, crypto relearned the lessons that traditional finance had long ago internalized. Let’s grant that the ICO bubble was instigated by a desire to break the rules around capital formation. Today, with the dust having settled and the ICO bubble now an awkward memory, we can reexamine its battle cries with more clarity. Did people really care about changing the rules around capital formation? Did they really care about democratizing investing access? Did they really care about reforming accredited investor laws, financial disclosures and AML/KYC requirements? Many intellectual commentators rallied against these during the run-up, but this too was probably just part of the frenzy of revolution. I don’t see much clamoring for this in 2019. As for the file sharing revolution — copyright law is, for all intents and purposes, mostly intact 20 years later. So what does the file sharing revolution tell you about the ICO bubble? First, it tells you that you should not take ideology at its word. The underlying causes of revolutions are usually more pragmatic than they appear. It also explains the supply side for ICOs, companies that wanted to circumvent traditional channels for capital formation, and the demand side, individuals who were desperate to get access to high-growth speculative investments. Once the incentive to break the rules has waned, the revolution is likely to stop. That is precisely what we’ve seen in both file sharing and in ICOs. But there’s another, darker side to explaining the ICO bubble — as an enabler of fraud, manipulation, and gambling. For this, we turn to our second historical model: the penny stock boom of the 90s. Balaji Srinivasan once claimed that tokens would turn blockchains into the world’s biggest stock market. This may someday be true — but for now, it seems that blockchains have become the world’s biggest penny stock market instead. The term “penny stock” evokes images of shady stockbrokers in boiler rooms, and for good reason. You’ll remember Jordan Belfort, the protagonist of the 2013 film Wolf of Wall Street, made his fortune hustling as a penny stock broker. Penny stocks are defined differently in different countries, but in the US, a penny stock is a stock issued by a small company that trades below $5 a share (originally it was stocks that traded below $1, but inflation and all). They are generally quoted OTC and seldom trade on national exchanges. They have low liquidity, little public information, and are not required to make significant financial disclosures. As such, they are plagued with fraud. The legal designation of penny stocks began after the 1929 stock market crash, which subsequently triggered the Great Depression. It was believed that the crash was partially caused by unbridled speculation on penny stocks, and this led to the Securities Exchange Act of 1934 designating legal restrictions on penny stock trading. Throughout most of the 20th century, penny stock offerings could not legally be placed in newspapers. Orders could only be placed via telephone. The highest quality penny stocks would only provide financial reporting once a year, and the very worst penny stocks had no financial disclosures at all. Given these barriers, penny stocks tended not to receive much attention. But starting in the mid-90s with the growth of the Internet, penny stock trading exploded. Discount brokers emerged, offering automated interfaces and much lower trading fees. As retail investors flooded in, the space grew faster than regulators could track it, and market manipulation became rampant. Eventually, the SEC stepped in and brought a string of high profile cases against Mafia crime families for penny stock manipulation schemes. All of these schemes were ultimately enabled by the Internet: it accelerated the velocity of fraud and allowed bad actors to connect directly with speculators. Penny stock trading has been brought back under stricter regulatory oversight, but it’s still extremely speculative, and manipulation is common. In 1989, the heyday of penny stocks, a survey found that Americans had been cheated out of at least $2B a year by fraudulent penny stock schemes. There’s an obvious parallel here with the ICO bubble. The SATIS group estimated that 81% (!) of ICOs were scams and it’s been widely reported that over $9M was stolen per day in 2018 (annualized, that would be upwards of $3B a year). By sheer number, the overwhelming majority of ICOs can be explained this way. But the parallel between ICOs and penny stocks runs deeper. Let’s take a step back here and ask: why are people so drawn to penny stocks in the first place, given how fraught they are? As a former professional poker player, I can tell you the answer is simple: people love to gamble. Humans will forever be drawn to the idea of turning around their fortunes, of outsmarting the establishment, of skipping steps on the social ladder. No matter how much gambling is stigmatized, regulated, or outlawed, it always survives one way or another. For penny stocks, they tap into the same greedy credulity behind all get rich quick schemes. It hardly matters what the underlying company does. But we must also acknowledge the other side of this market: the hustlers and fraudsters. To them, penny stocks are a gift. And they also don’t care what the stocks represent — they simply need a company with a ticker and story to manipulate. Greed takes care of the rest. Here’s a telling article published in 2000 on common Internet penny stock pump and dump schemes. Let’s contrast it to ICOs. Before the Net, these promoters hired squads of telemarketers to push their stocks on unsuspecting investors. Now, it’s as easy as blasting out e-mail, or if they’re industrious, maintaining a Web site. The modern version: hiring an ICO marketing agency, which will manage your Telegram chat, Subreddit, Medium account, and BitcoinTalk thread. Don’t have a real community? No problem, buy a fake one. The current fashion is to announce the discovery of a new, inexpensive method of sending broadband signals over telephone lines at speeds far exceeding existing technologies… The promoters issue a constant stream of press releases chronicling development breakthroughs, marketing agreements and endorsements of the technology from qualified scientists. How about a “hyper-scalable” “quantum-resistant protocol” for “supply chain management”? Getting some credentialed advisors to praise your protocol? Maybe rumored partnerships with a couple Fortune 100 companies? Optimistic posts then begin appearing on Internet stock message boards, such as those maintained by Yahoo and Raging Bull. Because few have heard of the new company, the promoters plant messages on other heavily frequented boards. If the promoters do a good job, and the market is strong, the stock price can soar from a few cents a share to $10, or in some cases, much more. Eventually, the share price collapses after the promoters sell out and quit pumping. You know the jig. Bounties, referral bonuses, airdrops, presales, advisor shares, purchased reviews, paid followers, social media bots, wash trading, painting TA signals, and so on. By the time the ICO boom had gone mainstream, this procedure was a well-oiled machine. Most of the long tail of ICOs — and that tail was very long — were complete nonsense. According to most trackers, the total number of ICOs was well into the thousands, and that’s only counting those that were able to rise above the noise. And like each penny stock boom before it, the ICO boom ended in multiple regulatory actions against the worst offenders. But regulators can’t reach everyone, and most of the pump and dumpers either moved on or continue to manipulate coins at smaller scales. ICOs, just as penny stocks, are a two-sided market. Speculators don’t care about the technology, they just want tickers to bet on and get rich. Fraudsters don’t care either, they just want tickers to manipulate and get rich. Everyone gets what they need, the market bustles with activity, and everyone makes money — until they don’t. If you think about it, global, uncensorable blockchains are basically the optimal platform for another penny stock boom. It’s no wonder that bad actors and speculators were quick to converge on it. But despite the technological accoutrements, it’s an old story. So what do penny stocks explain about the ICO bubble? Penny stocks explain the shitcoins, the scams, the unregistered securities, the market manipulation, and most of the long tail of the ICO bubble. Again, by volume, this is most of what was happening in the bubble. But I want to be careful here. Penny stock fraudsters were quick to co-opt ICOs, but the concept of an ICO didn’t begin that way. ICOs arose out of blockchain community crowdfunding, first pioneered by Mastercoin in 2013, with Augur being the first ICO on Ethereum in 2015. Most of their investors were nerdy cypherpunks, excited to support some new technology they could play with. We should not conflate cryptocurrencies, the underlying technology, with the ICO bubble, which was a speculative phenomenon that converged atop it. The ICO bubble was something that happened to crypto, not something intrinsic to it. Most of the technologists and cypherpunks who built this stuff were simply motivated by building a new financial system. And they’re still whittling away, even after the thundering herd of speculators and fraudsters have come and gone. So we’ve looked at P2P file sharing and penny stocks in comparison to the ICO bubble. But there’s still one aspect of the bubble that I’ve failed to address so far — technological innovation. After all, I don’t believe for a second that the crypto boom was principally about defrauding people, or that its underlying technology was irrelevant. The very opposite — the ICO bubble occurred atop the kindling of real technological innovation. To fully understand this, we have to turn to the last historical precedent: the dotcom bubble and its soothsayer, Carlota Perez. The World Wide Web — the Internet as most people know it — was created by Tim Berners-Lee in 1989. Its invention was the spark that set off the Information Age, and alongside it, the greatest stock market bubble of this generation. The rapid rise of the Web, combined with low interest rates and the Clinton tax cuts of 1997, led to an incredible bullishness around the growth potential of the Internet. Venture capital became cheap and opportunistic. Entrepreneurs flocked to Silicon Valley. Netscape, the company that built the Web’s most dominant web browser, kicked off the age. Netscape IPOed for $2.9B in 1995. It was somewhat unusual for an unprofitable company to IPO so successfully, but Netscape’s revenues were growing so rapidly that this would soon be forgotten. The Netscape IPO would be quickly followed in 1996 by Yahoo!, Excite, and Lycos, all fantastically successful IPOs by companies that were also growing rapidly. And though, like Netscape, they were burning through cash, it didn’t seem to matter. Internet companies had become anointed. Any company, so long as it had a “.com” in the name, attracted huge valuations. Investors pulled money out of slower-growth companies to plow more capital into dotcoms. Retail investors, having recently received tax rebates, piled in. The Internet itself became the interface for many investors, through platforms like E-Trade (which also IPOed in 1996). Many publications reported stories of white collar professionals quitting their jobs to daytrade tech stocks full-time. In just five years, the NASDAQ had risen more than 400%. This fomented an all-out frenzy. In 1999 alone, Qualcomm 26X’d its stock price. Analysts stopped emphasizing P/E ratios and began citing Metcalfe’s Law. A WSJ article from 1999 posed the question: are profits just a “quaint concept” that doesn’t matter anymore? The Super Bowl in January of 2000 featured no fewer than 16 dotcom commercials. Companies like Pets.com were going from incorporation to IPO in a single year. Almost every single IPO popped, with an average of 68% first-day gains. Investing in tech IPOs was widely agreed to be a foolproof way to multiply your money. A phenomenon of dotcom parties spread across the valley, and those close to founders often received “friends and family” shares as tokens of generosity. It was a time of excess. The trend was baffling to Wall Street, to the East Coast elites, to the old money. Storied hedge funds like Tiger Management went under, unable to keep up with the shifting market structure. But the techies — they knew it all along, they told themselves. The Internet would change everything. On March 10 of 2000, the NASDAQ would hit its peak. The first tremor of weakness was on April 14, likely triggered by a tax selloff. By the end of that week, the NASDAQ tumbled a staggering 25%. Soon, dotcoms realized that their burn rates were unsustainable. The Fed announced plans to aggressively raise interest rates, and the economy would see six such tightenings over the next several months. Capital wavered. By May 18th, Boo.com went bust. In November, Pets.com followed. A few months later, Webvan shuttered operations. The show came crashing down faster than it had started, and funding had all but vanished. By the end of 2001, after the September 11 attacks, most publicly traded dotcoms went bankrupt. Trillions of dollars of investment capital had evaporated. The ensuing recession would last several years. It wouldn’t be until 2004 when the first major post-crash dotcom company, Google, would IPO again. Its first day pop was 18%. With hindsight we can say that investing in the Internet was clearly right. It’s obvious how dramatically the Internet has changed the world. And yet the dotcom bubble seemed to have veered off somewhere terribly wrong. What happened? Why couldn’t people at the time see it? And what can it teach us about the ICO bubble? To understand the dotcom bubble, we have to start with Carlota Perez. Carlota Perez is the patron saint of venture capitalists. Her seminal work, Technological Revolutions and Financial Capital has been been cited by Marc Andreessen and Fred Wilson as pivotal to their understanding of the tech industry. I won’t do her book justice here, but I’ll attempt to summarize the key ideas that are relevant to both the dotcom crash and the ICO bubble. I’ll be quoting heavily from Carlota herself. Carlota Perez subscribes to the long wave economic cycle theory, known as Kondratiev Waves, in which technological innovation occurs in 45–60 year waves. Installation is the period when a new technology is first explored, installed, and then speculated on. This speculation leads to an unsustainable asset bubble and a spectacular collapse. Then a more sober period of deployment takes place, during which the technology matures and sustainably alters many aspects of society. After a full deployment cycle has exhausted its economic growth, a new technology initiates a new innovation wave, and the cycle begins anew. There have been five technological revolutions in 240 years… Each of these revolutions drives a great surge of development and shapes growth for half a century or more. The same general shape can be observed in each cycle. Each of these revolutions was kicked off by a seminal project that would catalyze the technology — the industrial revolution with Arkwright’s Cromford mill, the steam and railway age with the Liverpool-Manchester Railway, the steel and heavy engineering age with Carnegie’s Bessemer steel plant, the age of automobiles with Ford’s assembly line, and the computer age with Intel’s 4004 microprocessor. By this model, the moment that kicked off ICO bubble must be the launch of Ethereum. Ethereum was not the first cryptocurrency, but it was the first ICO to produce astronomical returns, and it would set the foundation for the frenzy that was to come. Ethereum launched in 2015, exactly 44 years after the Intel 4004 in 1971. Why call them revolutions, though? Because they go far beyond the powerful set of new industries; they also transform the whole economy by providing a new techno-economic paradigm. 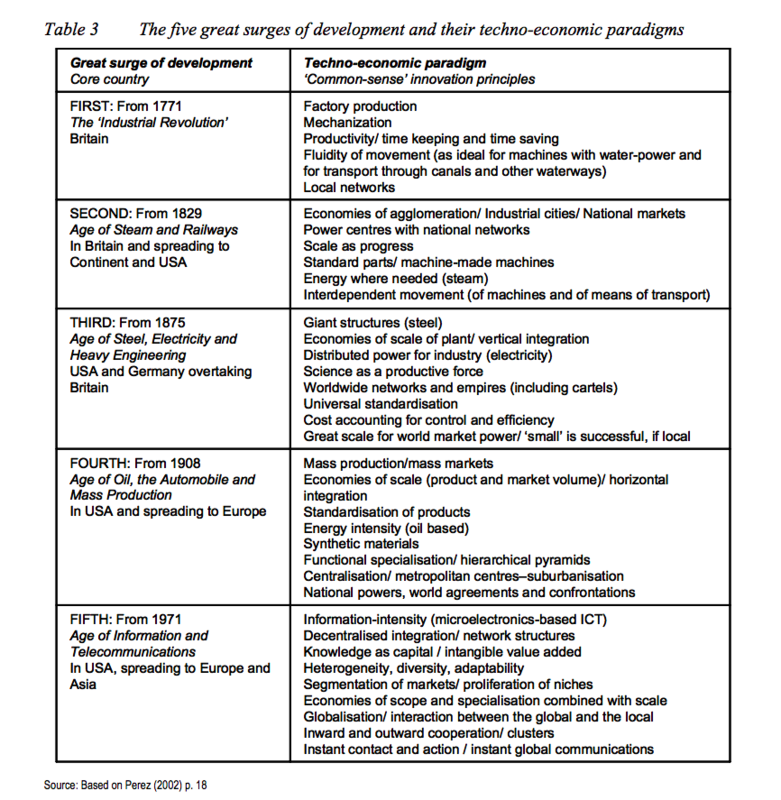 What does she mean by “techno-economic paradigm”? Simply put, a techno-economic paradigm is a new accepted way of doing things. When a new technology takes form and begins driving innovation, it brings with it a new logic of how businesses should be structured. For example, with the advent of the automobile, the paradigm encouraged businesses to adopt mass production, economies of scale, and standardized products for mass marketing appeal — the logic of the factory. In this paradigm, every American should own not just a mass-produced automobile, but also a TV, a refrigerator, a washing machine, etc. As a techno-economic paradigm becomes ascendant, any entrepreneur who does not subscribe to the new paradigm will be seen as low-status and behind the times. We know the techno-economic paradigm of the late internet revolution: move fast and break things, launch MVPs, iterate in short cycles, pursue business models with zero marginal cost. Basically all the mantras consumed today by aspiring tech founders. Basically, cargo culting the Ethereum ICO—the same way dotcoms cargo culted Netscape. In the ICO bubble, founders who deviated from this paradigm were seen as low-status, opportunistic, “not getting crypto,” and were thus less rewarded in their fundraises. Yet in hindsight, almost none of this was predictive of an entrepreneur’s long-term success. Keep the dotcom crash in the back of your mind. For now, I’m going to focus entirely on how Perez’s account of financial bubbles comports with the ICO bubble. If we have just witnessed the collapse phase, then it’s worth rewinding to what Perez has to say about the period that precedes it: the frenzy. Frenzy is the tumultuous period when financial capital takes off on its own… All those benefitting from this flourishing of opportunities believe the world is going through a marvelous time. In the frenzy, new millionaires are minted. They try to multiply their wealth in the same way they made it, redeploying their capital to generate more profits. The gap between paper values and real values widens, and the newly rich come to believe that their newfound wealth is due to superior insight and intuition. Financial capital… breaks loose, backs the new entrepreneurs, dismantles as much as it can of the institutional framework, overinvests in the new infrastructure, and also uses the new technologies to innovate in instruments for financial speculation. Dismantles institutional frameworks, check. Overinvests in new infrastructure, check. Invents new instruments for financial speculation (ICOs, SAFTs, SAFTEs), check. As the various assets go up in price, confidence grows that they will continue to do so… Since the profits to be had are amazing, everybody — including widows and orphans — eventually become aware of the incredible possibilities. They gradually dare to enter what used to be alien territory, trying to get a piece of the action. Do you remember being told by Uber drivers to invest in BAT or IOTA? Do you remember the New York Times article, Everyone is Getting Hilariously Rich and You’re Not? Do you remember the nonsensical projects? The teams that no one had heard of? The copy and pasted white papers? All the shameless rhetoric about 10 trillion dollar TAMs and 100K transactions per second? The financiers (and the investors who trust their money to them) seem to be convinced that they have discovered the most profitable vein. They then indulge in the intense repetition of the same successful recipe, be it from canals from any river to any river, as in the first revolution, or more dot coms and telecommunications. Do you remember all the ICO investing syndicates? The Telegram groups? The newsletters? During Canal Mania in the 1790s, canals were created from river to river with no regard for routing, believing that canals magically produced demand. In the 1840s, railway projects were built from town to town without regard for engineering practicality. In the 1920s, real estate values became untethered from the constraints of urban planning, believing that the automobile meant any territory could be valuable if connected by roads. And of course, in the late 90s, dotcoms were funded with no evidence of product-market fit. And of course, do you remember all the voices (rejoicing and lamenting) the new redistribution of wealth? The whole frenzy phenomenon is, at bottom, a huge process of income redistribution in favor of those directly or indirectly involved in the casino, which funds the massive process of creative destruction in the economy. That regressive distribution generates a double vicious cycle: one is economic, expressed in the market; the other is social, expressed in political terms. Both get worse as the bubble increases. Of course, every bubble comes with its dark side as we’ve already explored: the fraudsters, the pump and dumpers, the exit scammers. That permissive atmosphere generates an opacity that is highly convenient for corruption and for the flourishing of outright illegal activities… This is then a time for swindlers. The ICO bubble was simply a variation on the theme. The players and the tactics were different, but the human stories were the same. Like in the dot com bubble there were, as always, stories of overnight millionaires, flagrant scams, manifestos declaring a new technological order, levered debts and second mortgages that ended in catastrophe — all the usual roil and ruin of speculative manias. All this is to say, we’ve seen this before. Crypto’s gilded age is probably now over. Most of those newly minted millionaires have unwittingly surrendered their riches. The hype has died away, ICO funding has dried up, SEC enforcement actions are trickling in, and the media’s crush on crypto has passed. But, Perez reminds us, the frenzy phase and subsequent crash is not merely painful — it is necessary to any technological revolution. The financial casino attracts the funds necessary to install basic infrastructure and facilitate social learning. Without the dotcom bubble, there would not have been all of the investments into optical fiber buildouts, ISPs and internet infrastructure, packet-switched networks for telecoms, and all the competition overs consumers that would ultimately galvanize internet adoption. We needed that social and technological foundation in place for the Internet to flourish. Perez’s book was written in 2003 during the nadir of the dotcom crash, and she presciently situates the Internet within her K-wave framework. History has proven her right. But we should be careful not to invert her thesis: she claims that all technological revolutions induce a bubble, but that does not mean all bubbles are induced by technological revolutions. Indeed, most aren’t. It remains to be seen which camp crypto falls into. So what does Perez explain about the ICO bubble? She explains the logic of frenzy, the stoking of financial capital, and the rhetoric of paradigm shifts (“all companies will become decentralized”). She explains the influx of retail investors (“widows and orphans”), traditional financial capital piling in at dizzying prices (Telegram, Filecoin, Hashgraph), and the flood of traditional entrepreneurs contorting themselves to follow the new paradigm. The ICO bubble had no single cause. Mono-causal explanations always fall short in explaining complex phenomena. But its effects are easier to pinpoint. There are now many world class teams well-capitalized to build, scale, and evolve blockchain technology, and tens of millions of people in the world who now understand decentralization, proof of work, and private keys. Looking back, it’s really quite amazing! It comes at a high cost, but Perez hints: it’s likely that bubbles like these are the only way to overcome technological inertia. At the same time, most people had their first interaction with crypto during its orgiastic adolescence. It’s not a great look. But this has been true for every technological revolution of the last 250 years. In that regard, crypto is in good company. I was too young to appreciate the dot com bubble when it happened. It’s strange to say, but I’m glad to have witnessed a speculative bubble from up close. I’ve now got war stories to share with future generations. It was a wild time, when anyone in the world could launch a coin and raise tens of millions of dollars to build a network that no one could control. I don’t think we’ll see anything like that again for a long time. If you believe that crypto has the stuff of a technological revolution, then as Perez puts it, the collapse will pave the way for a more fruitful deployment phase. At the end of the day, I’m an optimist about technology. So it won’t surprise you that I think this deployment phase is coming. But it will be slow, unglamorous, and probably won’t make for nearly as entertaining of headlines. 3 Moments in History that Explain the ICO Bubble was originally published in Hacker Noon on Medium, where people are continuing the conversation by highlighting and responding to this story.